Shoot, save and share more 4K UHD than ever before. Get extreme speeds for fast transfer, app performance, and 4K UHD2. Ideal for your Android™ smartphone, action cameras or drones, this high-performance microSD card does 4K UHD video recording, full HD video and high-resolution photos. The super-fast SanDisk Extreme PRO microSDXC™ memory card reads up to 170MB/s* and writes up to 90MB/s*. Plus, it’s A2-rated, so you can get fast application performance for an exceptional smartphone experience7. Capture fast-action photos or shoot 4K UHD video2 with write speeds of up to 90MB/s*. 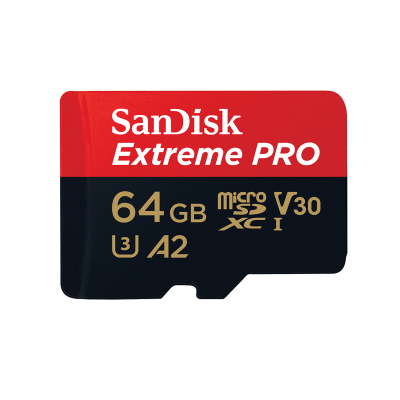 The SanDisk Extreme PRO® microSDXC™ UHS-I Card lets you shoot more and transfer even faster. Quick read speeds of up to 170MB/s* save you time when transferring high-resolution images and 4K UHD videos2. Ideal for recording outdoor adventures, weekend trips, or sporting events without skipping frames. With up to 400GB1, the SanDisk Extreme PRO® microSD™ UHS-I card lets you capture uninterrupted 4K UHD and Full HD video with its UHS Speed Class 3 (U3) and Video Speed Class 30 (V30) ratings5. Get faster app performance for an outstanding smartphone experience thanks to the SanDisk Extreme PRO® microSD card’s A2 Specification. SanDisk Extreme PRO® microSDHC™ and microSDXC™ UHS-I Cards are shockproof, temperature-proof, waterproof, and X-ray-proof4, so you can enjoy your adventures without worrying about the durability of your memory card. * For 64GB-400GB: Up to 170MB/s read speeds, engineered with proprietary technology to reach speeds beyond UHS-I 104MB/s, requires compatible devices capable of reaching such speeds. Up to 90MB/s write speeds. For 32GB: Up to 100MB/s read speeds. Up to 90MB/s write speeds. Based on internal testing; performance may be lower depending upon host device interface, usage conditions and other factors. 1MB=1,000,000 bytes. 4. Card only. See www.sandisk.com/proof for additional information and limitations. 5. UHS Speed Class 3 (U3) designates a performance option designed to support real-time video recording with UHS-enabled host devices. Video Speed Class 30 (V30), sustained video capture rate of 30MB/s, designates a performance option designed to support real-time video recording with UHS-enabled host devices. See www.sdcard.org/consumers/speed. 7. For 64GB-400GB: A2 performance is 4000 read IOPS, 2000 write IOPS. For 32GB: A1 performance is 1500 read IOPS, 500 write IOPS. Results may vary based on host device, app type and other factors. 8. 30 years in Germany, Canada and regions not recognizing lifetime warranty, visit our warranty and user guide page for more information.